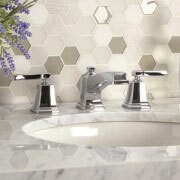 A nicely remodeled bathroom is one of the most immediate ways to add value to any home. Once relegated to the role of a strictly utilitarian space, today, many homeowners want their bathrooms to be miniature spas, with luxuries and amenities that will allow them to enjoy every minute they spend there. At ProSource® of Davenport, trade pros won’t have any problem finding the products they need to create a private oasis in any home. Modern bathroom sinks balance practical design with pleasing aesthetics to create basins that can bring any bathroom decor together. Our showroom is fortunate to have an incredible assortment of sinks in above- and under-counter options, as well as pedestal mounted choices. Like no other fixture in the bathroom, the sink faucet can’t either bring together or interrupt the visual makeup of a bathroom. Rather than struggle with a bland, leaky faucet, replace it with one of the many elegant options we have available at ProSource of Davenport. Every homeowner loves their shower. It’s a welcome refuge after a hard day at work, or a way to start a new day fresh. Clean up the look of your client’s shower with the amazing assortment of shower heads, handles, doors, tiles, and many other accessories available through our showroom. Without proper storage space, any bathroom can feel cluttered and cramped. But using any old storage option might interrupt the luxurious aesthetic of the bathroom. 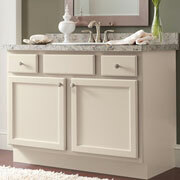 Why not include a new vanity in your remodeled bathroom? 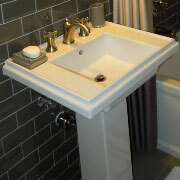 It’s classy appearance, and practical use frees up valuable storage space in the bathroom. 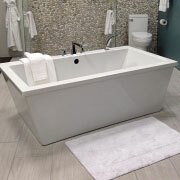 Your client’s cares will wash away when they sink into a brand-new marble or porcelain tub. ProSource offers tubs of all types, styles, and finishes to meet the needs of trade pros. Visit our showroom to see our complete line of offerings. While considered the throne of many homes, an old toilet in a newly remodeled bathroom is befitting of no one. Beautify your bathroom with a new toilet from ProSource. 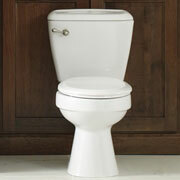 For clients that are living eco-friendly lifestyles, trade pros can add a water saving toilet to their project.